WILLEMSTAD - Curacao violates the human rights of Venezuelans coming this way illegally in many areas. That became clear in a devastating report from human rights organization Human Rights Watch. Human Rights Watch has received credible reports from several sources who requested anonymity that government authorities are actively conducting immigration raids, verbally and physically harassing Venezuelans, and detaining Venezuelans for indefinite periods in inhumane conditions and without access to legal counsel. They also report that authorities have deported some Venezuelans who attempt to seek asylum, including those whose claims may qualify for protection under Article 3 of the ECHR, and have pressured detained parents to inform the authorities of the whereabouts of their children so they can be deported together. Venezuelan children are entitled to education, but access to school is often hampered in practice. Also, no residence permit has been issued for over a year, although there are hundreds of applications. The Kingdom Government must intervene, according to Human Rights Watch. According to the report, the government publicly stated in July 2017 that it had taken over responsibility from the UNHCR for registering asylum seekers and issuing asylum-seeker certificates. 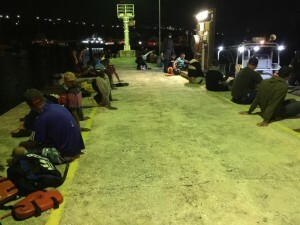 The Human Rights Watch says that to the best of their knowledge, the Curaçao government has not issued a single certificate since then, even though hundreds of Venezuelans have requested an interview to seek asylum in Curaçao. The report also states that although Curaçao is not bound by the 1951 Convention or its 1967 Protocol, as a constituent country of The Netherlands, Curaçao is bound by the European Convention of Human Rights (ECHR). Article 3 of the ECHR prevents refoulement in cases of torture or inhumane treatment, including some cases of lack of access to health care. The government of The Netherlands is answerable for violations of the ECHR that occur in Curaçao, including any deportations that violate the nonrefoulement provisions of Article 3.